C++ how to add,subtract,multiply,divide two complex numbers? In this post we will discuss two programs to add,subtract,multiply and divide two complex numbers with C++. In the first program, we will not use any header or library to perform the operations. The second program will make use of the C++ complex header <complex> to perform the required operations. The two programs are given below. i)Addition,subtraction,Multiplication and division without header file. ii)Addition,subtraction,Multiplication and division with header file. In this method our program will consists of a structure that will hold the real and imaginary number of the two complex numbers. We will also define different functions for addition, subtraction , multiplication and division of the complex numbers. In this way we can organize our program better for maintainability and better understanding. The structure is given below. The double type is prefferrable because it is big enough to hold any large number. In the addition function, we will add the real part separately and the imaginary part separately. The complex number resulting from their individual separate sum is the resultant complex number. The function is given below. This function will subtract the real part and the imaginary seperately. The definition of the subtraction function is shown below. The if() statement is used to check if the imaginary part is a negative value, and if so, we will put the value under the bracket. The bracket will distinguish the negative sign of the imaginary value from the normal addition sign of the complex number. To get the product of the two complex numbers we simply evaluate the expression (ac-bd)+(bc+ad)i considering that a+ib and c+id are the two complex numbers. The function definition is shown below. To divide a+bi by c+id we will perform the operation (ac+bd)/(c2 + d2) + (bc-ad)/(c2 + d2)i. The pow() function will calculate the square of the real and the imaginary value of the denominator complex number. The main() function does nothing, it simply asks the user to input the two complex numbers. The whole program is shown below. 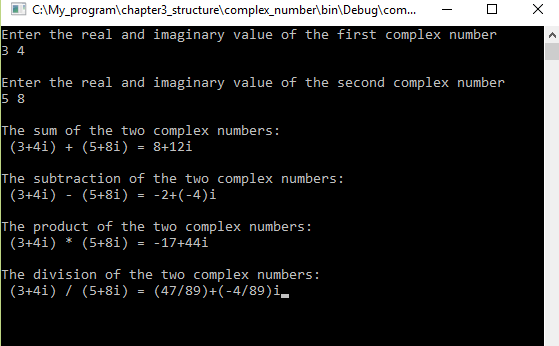 The screen shot of the output with the two complex numbers as 3+i4 and 5+i8 is shown below. ← C++ Why you should prefer ‘double’ type over other floating point types?